THERE ARE FEW ACADEMIES IN WORLD FOOTBALL that can boast a history brimming with illustrious names quite like Sporting CP’s. The Academia Sporting, located in the Portuguese municipality of Alcochete, has produced a roll call of superstars throughout the ages. From Luís Figo to Cristiano Ronaldo, Sporting’s academy is responsible not just for providing quality footballers, but genuine national heroes. The educational methods drilled into the young footballing students at this fabled breeding ground have led players to Champions League winner’s medals, Ballon d’Or trophies and the very summit of the game. For a club of reasonably modest size in the wider context of European football, Sporting are giants in the production of talent. Nurturing promising young talents is a deeply embedded fabric for the club and their continued dedication to honing the stars of the future has earned them a celebrated reputation in the world of coaching. The conveyor belt of talent has consistently sailed along and it shows no signs of dwindling in the foreseeable future. This is the story of how Sporting keep their academy at the top. In 1997, a young footballer left his home and embarked upon an exciting footballing journey. Although it was inarguably one of the happiest times of his life, the next chapter in his life was terrifying as it was thrilling. Leaving the Madeira Islands for the hustle and bustle of the capital city, Lisbon, it was an opportunity of a lifetime for a 12-year-old footballing prodigy with wonderful potential and immeasurable ambition. Clearly possessing talent in abundance, the boy-wonder was still far from the finished article as he arrived in Lisbon. The boy was Cristiano Ronaldo. Now considered perhaps the greatest footballer of his generation – indeed one of the greatest of all time – Ronaldo was just a scrawny, pre-pubescent kid when he joined the illustrious Sporting academy. His mission was to convince the coaches that he was good enough to go all the way to the top of the professional game. Ronaldo’s self-confidence was unshakable and although he was a long way from home, his determination to impress the coaching staff shone through. It became immediately clear that Sporting had unearthed an exceptional player. At first, the staff at Academia Sporting were not impressed with Ronaldo’s skinny physique, but once he got the ball at his feet, their opinion changed dramatically. They were instantly impressed by his technique, pace and courage at taking on defenders. He was signed for €22,500. For a 12-year-old who had just arrived for a trial, it was an exorbitant price to pay. But with that, Ronaldo had joined an academy with star-studded alumni. His talent was undeniable, but the task of transforming this exciting attacker into a world-class proposition was still an unenviable task. Ronaldo’s road to perfection has been far from serene and the troubles began during schooldays in the capital. Ronaldo was mocked by his schoolmates for his Madeiran accent; a dialect which sounds wholly different to the Portuguese spoken in Lisbon. He was traumatised and severely home-sick. However, Ronaldo’s path to greatness was not about to hampered by a few petty bullies. It aggravated him, causing incidents where Ronaldo threatened a teacher with a chair and responded impudently to a coach who had asked him to help clean the changing room. His temperament was in need of fine tuning but, fortunately for his future, he was in the ideal environment to receive direction and guidance through a distinctly lonely and troubling spell in the young footballer’s life. Luckily, Sporting’s academy is renowned for helping their young stars off the pitch as well as on it. He received counselling from a psychologist and benefited from one-on-one tutoring from a fellow islander, which greatly helped the process of acclimatisation. However, Ronaldo was still unruly in school. Adhering to the strict discipline at both school and the academy had been an issue but he received a wake-up call when he was omitted from the final round of the championship against Marítimo. Ronaldo was irate, stomping around the training ground demanding an explanation. But the coaches stood firm and he did not travel to the game. It was a very important lesson for the youngster and a significant juncture in his development. To leave out one of the academy’s finest ever talents in such a crucial game was testament to the unwavering faith held by the Sporting youth coaches to their craft. At the academy, there have always been rules, codes and expectations of the players. The guidelines are never strayed from, not for anyone. Not even a prodigy like Ronaldo. There is an inescapable sense that the coaches at Sporting have an unwavering faith in their methods. Making Ronaldo realise that he was not bigger than the academy or the club was perfectly demonstrative of the values and standards upheld by the coaching staff. The system in place at the Sporting academy can hardly be called into question; Ronaldo made his first-team debut when he was just 17. Inevitably, he was spotted by one of club football’s heavyweights – Manchester United – and was sold for a tidy profit. It was obviously difficult to watch one of the greatest talents leave the club but the Sporting way has been built around the discovery and development of talent, tempered by an acceptance that the highest quality of players will eventually be sold. It is what stimulates the club. Like Ajax, Sporting scout the best talent around Europe and prepares them for the best leagues in the world. Former Sporting, Porto, Aston Villa and Portuguese international defender Fernando Nelson explained the reason for the club’s success: “Sporting depend on youngsters. They are a source of income. Obviously, they try to give the best conditions to youngsters and they also pay them more money than other clubs. As a result of their scrupulous scouting and excellent training programmes, they are rewarded with the finance that keeps the club thriving financially. The ultimate destination of the greatest talent is a bitter pill to swallow, but the widespread recognition and praise directed at the academy is still immensely satisfying. The academy’s widely revered development programme was enhanced and refined eight years ago after a move to the state-of-the-art Academia de Futebol de Sporting at Alcochete. Located on the southern outskirts of Lisbon, near the River Tagus, it is considered the best in the country and resembles something like a mecca for aspiring footballers; a temple with the greatest teachers in the complicated art of mastering football. At Alcochete, there are seven training pitches – four natural and three artificial. The academy is located in a quiet, rural area on the suburb of Lisbon and the tranquil environment, from which the burgeoning footballing talents are free from distractions and the excitement of the city, has been a key factor in the stunning development of so many players. The emphasis on skill and technical ability is absolutely paramount at the academy. From the under-nine level, right through to under-19, the academy pupils are led through a series of expertly orchestrated training exercises and routines, specifically geared at the enhancement of skills, decision-making and overall competitiveness. The preparation of youngsters for the heady heights of the professional game is taken as a three-step process. The first is player recruitment, followed by player development, and finalised by player management. During the exhaustive transformation process, the training and education are rigorous. Players are in school until 4pm and then train every night. There is obsessive attention to detail and that is portrayed throughout the different elements of the physical fitness program. Players spend up to an hour in the gym training with weights specifically for muscles that will benefit their game. For example, there is a particular emphasis on strengthening the quadriceps, abdomen and calves, adding power to the player’s toolkit. Muscle-building is fundamental to the overall development of the player, the Sporting coaches believe. Ronaldo was a withering string of a boy when he arrived at the club but, through working intensively with weights, he left for Manchester United with greater tone and definition in his legs, chest and arms. Obviously, Ronaldo’s undying dedication to keep his body in peak physical condition has given him an astonishing physique later in his career, but the seeds were certainly sown during his education at Sporting. Weight training is important, but the ultimate goal and ambition from the training is to build footballers with a strong competitive attitude, maximum concentration, a strong team spirit and ability to identify and exploit an opponent’s weaknesses. Perhaps the most notorious exponent of each of these characteristics is Luís Figo, who remains, to this day, one of Sporting’s most decorated luminaries. Again, with Figo, the productivity of Sporting’s scouting network was evident. Figo was drafted into the club aged just 11, after playing mainly street football for Os Pastilhas in Almada. It has always been an impressive facet of the scouting network; the ability to identify excellent talents at such an early age. Figo was identified as a blessed individual and the coaches at Sporting’s academy worked tirelessly to transform him into an outstanding all-rounder capable of reaching the very highest level of the professional game. Figo was thoroughly schooled in the ways of the game before making his first-team debut aged 17. 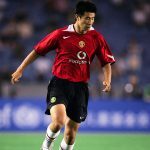 Considered one of the greatest wingers of his generation, the Ballon d’Or winner of 2000 built his repertoire of attributes at the academy, focusing on his technique for passing and his skill to beat players on the wing. Figo’s game revolved around terrorising defenders with his pace, bombarding penalty areas with quality crosses and scoring goals with his devastating strike. His career undoubtedly accelerated greatly under the masterly stewardship of Johan Cruyff at Barcelona after he moved to Camp Nou in 1995, but it was under the equally wise tutelage of the Sporting coaches that he initially sharpened his skills and embraced the craft of playmaking with enthusiasm and professionalism. One of the most memorable periods of Figo’s career was, of course, his controversial move from Barcelona to Real Madrid. At that time, Figo had lit the tinderbox in Spanish football and his move was regarded as traitorous and unforgivable by the Barça fans, as he was presented as a key member of Madrid’s Galactico empire. The media circus was unprecedented. Everywhere Figo went, he was met with hordes of photographers and reporters but Figo stayed silent. The frightening prospect of chaotic El Clásico scenes in years to come failed to faze him. The transfer shattered the landscape of Spanish football but his career was not derailed by the ensuing storm around him. Figo was Barcelona’s greatest player and prized asset but he identified Real Madrid as the platform from which he could reach true superstardom. He was right. He won the Champions League with Real Madrid, a trophy that had eluded him up until that point in his career. His continued upward trajectory was a sign of the indestructible mental attitude he developed at the Sporting academy. Not dissimilar to Cristiano Ronaldo, the leader of Portugal’s ‘Golden Generation’ maintained an insatiable appetite for victory to compliment his hunger, commitment and tremendous passion for the game. These were all characteristics which were born during his time at Sporting. The Sporting academy does not rest on the star-power of their former graduates, however, as they continue to improve the future of the game by yielding several more prodigiously talented youngsters. In recent times, players such as William Carvalho have risen through the various ranks of the club’s set-up to stand on the verge of becoming one of European football’s finest players. Carvalho is highly regarded in his home country; it’s unsurprising considering his consistency, and he was a member of Portugal’s Euro 2016-winning squad. He is an intelligent and tactically astute operator who would slot in well at Old Trafford. His rise to prominence is further proof that the Sporting academy is still flourishing and producing stars on a regular basis. The Sporting academy leads the way in the development of young footballers and thanks to an unrelenting passion to further the progression of these players, the club continues to generate eye-catching talent at an enviable rate. Its roll-call of graduates is truly something to behold and their modernised structure of scouting and developing footballers means we may not be far from discovering the next Ronaldo or Figo.